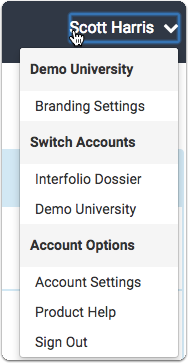 This article explains how your Interfolio account dashboard is configured, some basics on what you can do once you're there, and how you can access your account settings to change basic user information. After signing in, you will see your account page. 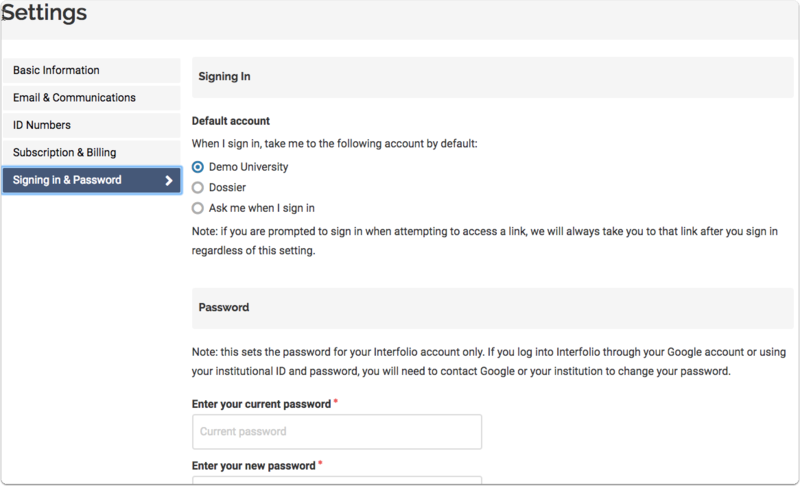 From here you can access all of the accounts you have with Interfolio and your Interfolio Account Settings. You will find links to the Interfolio products to which you have access on the Interfolio account screen. 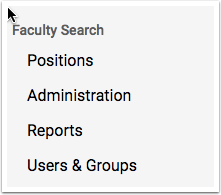 If your institution uses Review, Promotion & Tenure, Faculty Search, and Faculty180, than relevant pages will be displayed here. 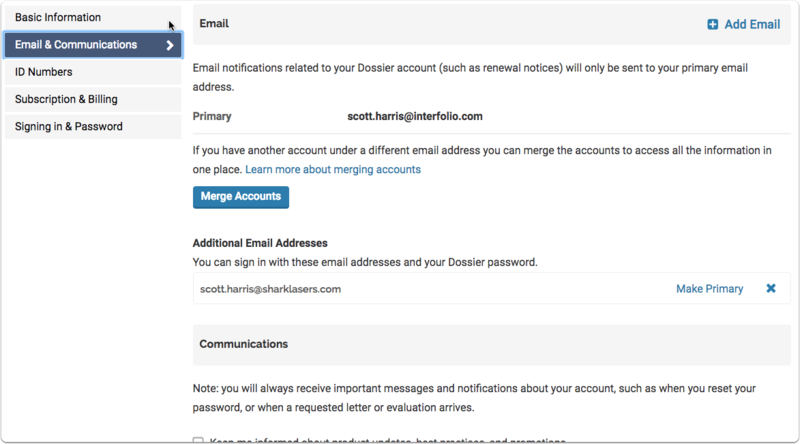 You can also access your Dossier account (personally or institutionally created). If you have access to one, you can access it by the user menu in the top right corner. Read about how to brand institutional products here. Depending on your role in the program, some or all of the following functions are available from the dashboard. 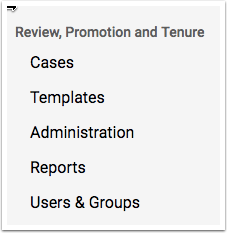 Not all of these functions or links will appear for Evaluators or Committee Managers in the program. 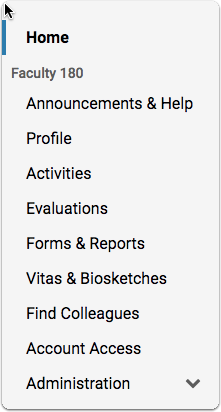 Depending on your role in the program, some or all of the following functions are available from the dashboard. Not all of these functions or links will appear for Committee Managers or committee members in the program. 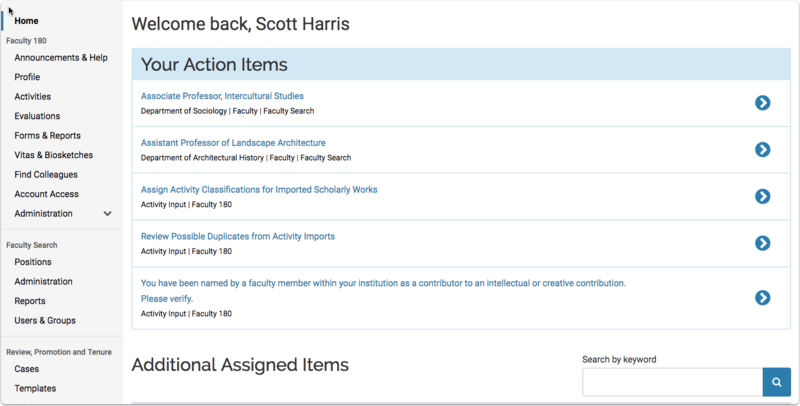 Users will only see the relevant pages, depending on institutional settlings. Click your name in the upper right hand corner of the screen and select "Account Settings" from the drop down menu. The tabs below appear if you have a Dossier and Interfolio account. 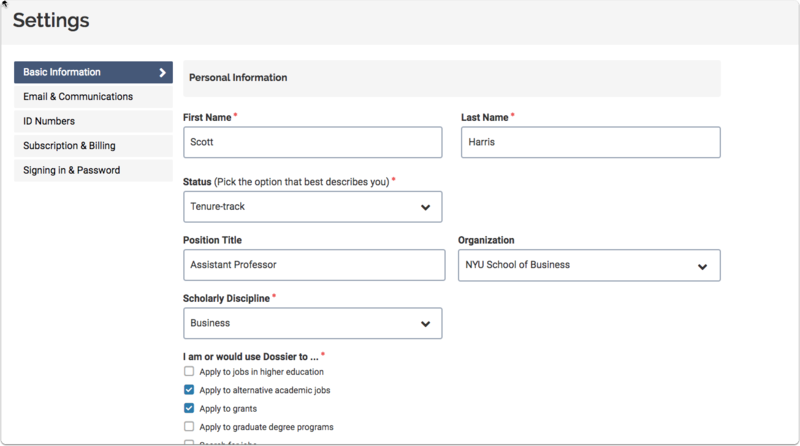 From the "Basic information" tab of "Account Settings," you can access and manage personal information such as your career details, and also contain information like your address and degree. In other tabs you can find your email and notification settings, and any delivery ID numbers associated with your account, as well as some other settings. Need to add ID numbers regularly to your deliveries? If so, than you can use the Interfolio ID storage tool to be able to easily store and attach it to your deliveries. 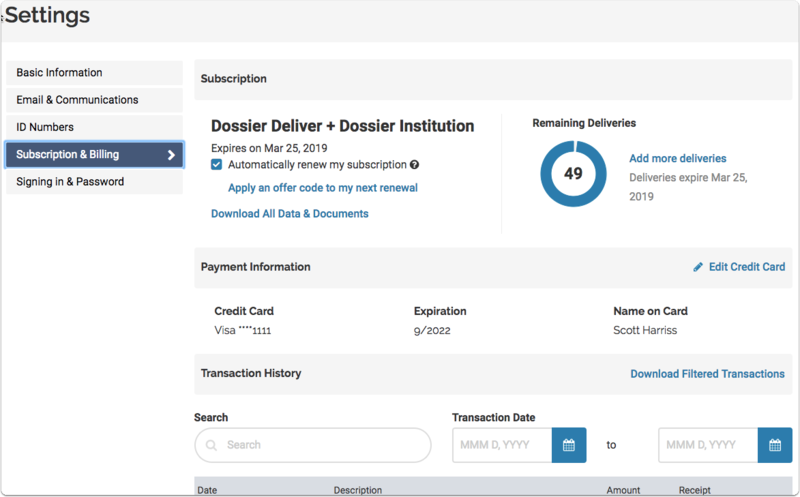 From the "Subscription & Billing" tab, you can renew your account, add deivery credits, view your remaining deliveries, download all data and documents in your account, manage payment info, and view and download a record of your transactions. 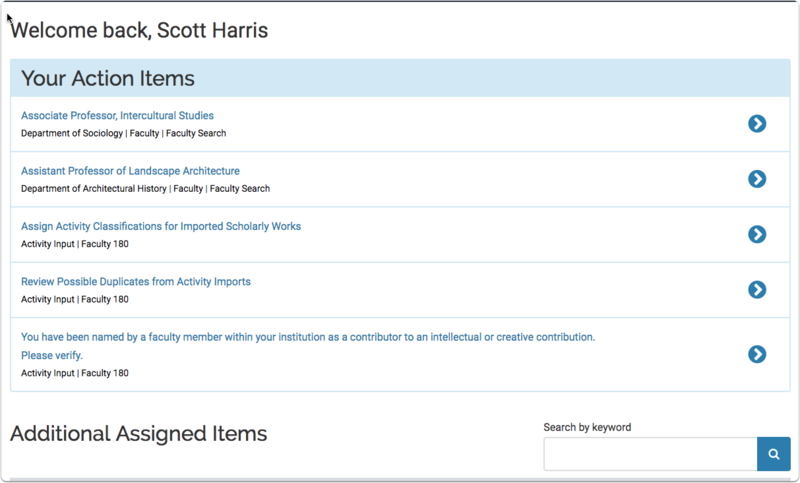 Users will receive alerts and notifications on the homepage in the to-do action items, urgent items with deadlines and mandatory response will appear at the top and the rest will overflow to a searchable table at the bottom.